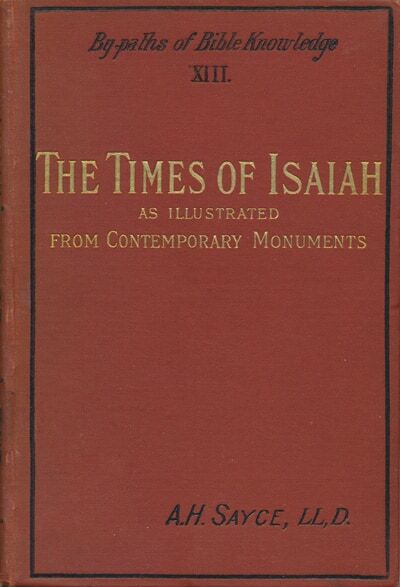 Professor Sayce provides a helpful summary of the archaeological background on the Isaiah and his writings. In so doing he seeks to place the prophet in the wider context of the Ancient Near East. This title is in the public domain. In the following pages an attempt has been made to bring before the modern reader a picture of the external and internal politics of the Jewish kingdom in the age of Isaiah, one of the most important epochs and turning-points in the religious history and training of the Chosen Race. The materials for drawing such a picture are derived partly from the Old Testament, partly from the monuments of Egypt and Assyria, which in these our days have thrown so vivid and unexpected a light upon the earlier history of the Bible. Without them, indeed, the present book could never have been written. It is with their assistance that the pages of the sacred record have been supplemented and illustrated, and the course of events which seemed such a puzzle to the scholars of a former generation has been traced in its broad outlines.